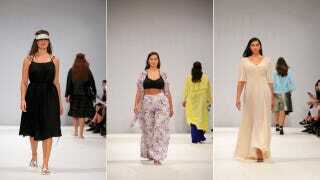 Here's a milestone: This year's London Fashion Week included a real-deal plus-size runway show for the brand Evans. Which is even more remarkable when you consider they're the UK equivalent of Lane Bryant. Maybe the plus-size corporate motherships really are catching on! Not sure what they were thinking with those sparkly visors, but I see several pieces I'd go to the trouble of ordering. "This is a big and important part of the market, and we need to be seen to embrace it. You cannot ignore the market place," Green told WWD after the show. "And you can't be defensive about it, or apologize about [plus-size fashion]. Why should the category be any different from petite?" Then how about we get some plus-sizes over at Topshop, or at least some Topshop pieces in Evans? Hmmm?